Chouf Ouchouf: the Medina, the old quarter, where it’s ten to a house, and a hundred to the narrowest street. Shout or you won’t be heard; push to the front or never be seen. Life and colour lie round every corner, animals and cigarette hawkers fill the squares. The city is unruly and chaotic, but that’s of no matter – beneath the clamour and fights of the market are the whispers of its other life. Dusk falls like a shutter, and then the night. Silently the walls open, and amid the maze-like streets and along the rooftops figures move on secret agendas. 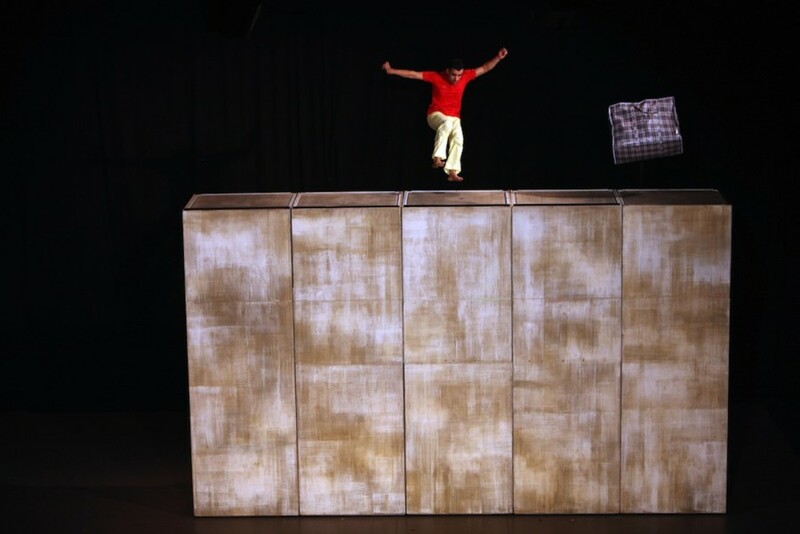 Returning to the UK with Chouf Ouchouf a show about what they know best – their home – the Groupe Acrobatique de Tanger collaborate with Swiss artists Zimmermann and de Perrot to capture the danger, joy and urgency of life in Tanger. Those who saw the Groupe’s last production, Taoub, will find them more mature, stronger, and yet with the same rough charm, the same rich language of vernacular acrobatics that has been passed from generation to generation. With Chouf Ouchouf they move through a set that floats apart and reassembles to present the many faces of a bewildering and exciting landscape, taking in the old and the nearly new in search of the city’s beating heart. Chouf Ouchouf toured the UK in May and June 2011 to these venues – Scotland’s Eden Court and macrobert Arts Centre, London’s Queen Elizabeth Hall Southbank Centre, Hall for Cornwall, Southampton’s Nuffield Theatre, Brighton Dome and Theatre Royal Norwich.